Laufen pro is a comprehensive bathroom range, which offers the ideal solution for every spatial situation and requirement and also reflects the building values of the current generation. Designed by Swiss designer Peter Wirz, this versatile range is ideal for home or commercial use. 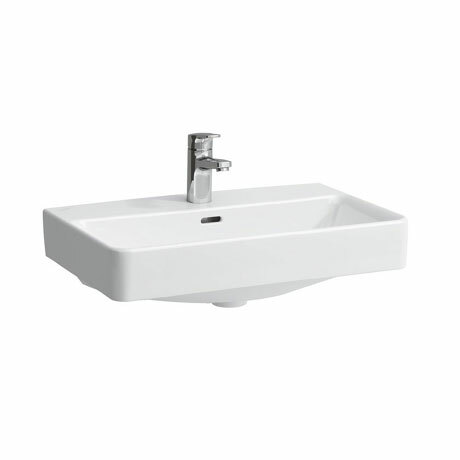 This compact 1 tap hole ceramic basin has a short projection of 380mm so makes it ideal for small bathrooms or cloakrooms. Its ground base means it is designed to be countertop mounted and as all sides are glazed allows you to beautifully accessorise with a mirror that can be hung directly behind. Made from high quality vitreous china it is backed by Laufens 5 year guarantee.